Steve Sheppard, William Enfield Professor of Law, provides an introduction to this reprint of the sole edition of a classic of the British Raj era. As the remarkable architecture of Calcutta is the physical embodiment of the synthesis of India and colonial Britain, so A Short Treatise exemplifies the synthesis of their legal traditions. Herbert Cowell was an English lawyer who practiced in colonial India in the early 1860s and became a professor of local laws. His Short Treatise grew out of his Tagore Law Lectures of 1870 and 1871 and from a series of lectures delivered to the students of the Inns of Court in 1893. 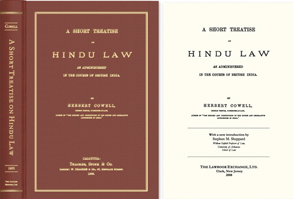 The work details laws observed by members of the Hindu community in India that were recognized under British rule and incorporated into the colonial legal system. These dealt principally with family organization, land tenure and succession. It dates from a time when Anglo-Hindu law was a mature system at its highest level of sophistication.